I've arranged what I hope will be a nice treat for y'all. Author Tom Kelly has graciously agreed to guest-host this blog from October 23-27. 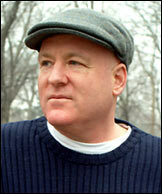 Tom is the author of three novels: Payback (1997), The Rackets (2001), and Empire Rising (2005). Both The Rackets and Empire Rising were selected as Notable Books of the Year by the New York Times; read a review of Empire Rising by Joe Klein here. If you haven't read Tom's books, grab a copy below. You'll be glad you did.